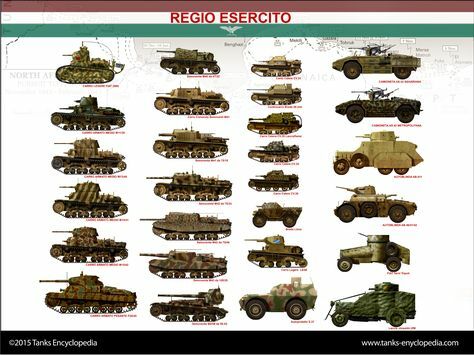 In 1938, the latest design available for the Regio Esercito was the CV-38. In 1936, a specification for a new turreted design was issued. The Carro Armato (armored vehicle) L6 (L for Leggera, “light” and 6 for the standard weight, 6-tons in battle order) model 1940 wasn’t designed from scratch. Prior to this, the 5-ton Carro D’Assalto modello 1936, based on the previous CV-35 tankette, was tested with a short barrel L26 37 mm (1.46 in) gun and coaxial Breda 6.5 mm (0.26 in) machine-gun. The suspensions were redesigned, with two bogie arms and one rear independent bogie, similar to that on the previous tankettes. The central superstructure was higher and a small one-man turret fitted. 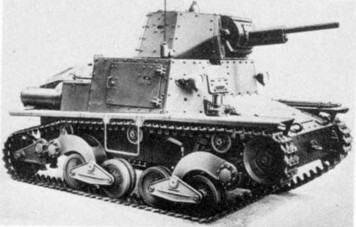 The Carro Cannone 5t modello 1936 was another prototype, testing a 37 mm (1.46 in) L/26 gun mounted in the hull, and the turret held a Breda machine-gun. Since the suspensions needed to be reworked, a new Ansaldo-FIAT prototype was tested by the m6T, featuring the new hull design and the light turret mounted on the Autoblinda AB 40, with a twin Breda 6.5 mm (0.26 in), and a sponson-mounted 37 mm (1.46 in), in 1938. The final prototype was reequipped with the larger turret of the Autoblinda 41, initially sporting a short barrel Vickers-Termi L/21 37 mm (1.46 in) and, on production models, a 20 mm (0.79 in) Cannone-Mitragliera da 20/65 modello 35 (Breda), with good antitank capabilities, and a coaxial Breda M38 8 mm (0.31 in) machine-gun. The L6/40, first introduced in 1940, was produced from early 1941 to the fall of 1942. It was the latest light tank design in Italy, although seemingly obsolete by 1942 standards. The bolted hull was derived from the M6T and the suspension was a revamped model of the one used on the 1936 Carro D’Assalto. The hull was short and the maximum armor, 40 mm (1.57 in), was only found on the gun mantlet and frontal glacis, thought capable to stop 37 mm (1.45 in) gun fire. The rest of the armor was and 20 to 6 mm (0.24-0.79 in) thick. This was a cramped tank, with the gunner/commander on the left side, in the turret, and the driver on the right. The overall weight, in battle order, was 6.8 tons. The main turret, similar to the one on the Autoblinda 41 model, could fully traverse and had -12° to +20° elevation (manual). The FIAT SPD 18D petrol four-cylinder developed 70bhp@2500 rpm, with a 10.3 hp/ton ratio. The gearbox was 4 forward-1 reverse, and steering was done by clutch brake. Fuel capacity was 200 l of gasoline. The suspensions used a modern torsion-bar system, with front drive sprocket and rear idler wheel, two rubberized pairs of road wheels and three return rollers on each side. The 89 shoe link tracks had a 2.69 m contact surface. Consumption was 100 liters/100 km on road and 250 liters off-road. On trials, the L6/40 was found capable of climbing 31° slopes, 1.7 m wide trenches and 0.7 m high obstacles, with a maximum 80 cm fording depth. The preseries production started in May 1941. Fiat-Ansaldo had initially designed the vehicle for the export market, as a response to the earlier Vickers 6-ton. However, the army showed interest in it, and production was initiated in early 1941. One variant was equipped with a new transmission, in 1943 (late production), with no exterior differences. 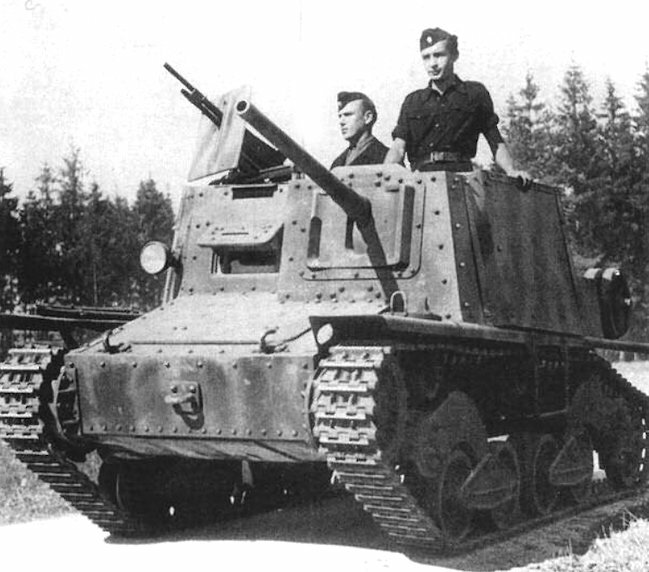 The radio version had an open-turret, and the L6LF (Lancia-flamme) was equipped with a 200 l gasoline fuel tank. The best-known and most successful variant was the Semovente 47/32 tank-hunter, with no turret and a 47 mm (1.85 in) mounted in the hull. Around 300 units of this derivative were produced and formed the bulk of Italian AVFs during the Eastern campaign. The last version was the ammunition carrier, used alongside the Semovente 90/53, carrying additional ammo for the howitzer, as only 6 rounds could be carried by the SPG. It was open-topped and only carried a 8 mm (0.31 in) Breda machine-gun. Although efficient as a scout tank and deployed in cavalry and reconnaissance units, the L6/40 was also quickly put in regular units, due to the shortages of medium tanks the Italian army experienced by 1941. The L6/40 saw its baptism of fire in the Balkans (April-May), and formed a large part of available Italian armor during Operation Barbarossa. By the beginning of 1943, the survivors or the Russian Stalingrad offensive retreated across the Ukrainian steppes. In North Africa, some L6/40s took part in operations through the summer to the fall of 1942, with the Ariete division and Bersagliers independent companies. They soldiered in Tunisia, Sicily and Italy. After November 1943, the Germans took over all existing vehicles and the production of the final version. They saw service with the Wehrmacht and Italian forces of Salo, but also in France, Albania and Greece in 1944. Carro Armato L6/40 prototype, northern Italy, March 1940. Notice the model 1932 gun. Carro Armato L6/40, preseries, LXVII Battalion of Armored “Bersaglieri”, Celere Division, Armir, southern Russia, summer 1941. Carro Armato L6/40, radio version, Bersaglieri recce unit, Eastern front, summer 1942. L6/40 1941 series, Vth Regiment “Lancieri di Novara” – North Africa, summer 1942. L6/40, supply version, serving the Semovente 90/53 self propelled howitzers, “Bedogni” artillery group, Sicily, September 1943. Pzkpfw L6/40 733(i), SS Polizei division, Athens, 1944. Was the 20mm on the L6 an autocannon by any chance?